Interesting note on this poster: This is one of the first doublesided posters. John Carpenter, the master director of terror and suspense, returns to the screen with this science-fiction action thriller; the story of a society overtaken by aliens who control the earth through a television system whose hypnotic signal lulls an unsuspecting public into submission. They Live stars Roddy Piper as a struggling blue collar worker who stumbles upon a deadly discovery: the insidious control of the mass media by terrifying creatures from another planet masquerading as humans. Alive Films Presents a Larry Franco Production. John Carpenter's They Live Starring Roddy Piper, Keith David, Meg Foster, George "Buck" Flower, Peter Jason and Raymond St. Jacques as The Street Preacher. Screenplay by Frank Armitage. Based on the short story "Eight O'clock in the Morning" by Ray Nelson. Music by John carpenter and Alan Howarth. Director of Photography, Gary B. Kibbe. Associate Producer, Sandy King. Larry Franco. Directed by John Carpenter. A Universal Release. The age old advertising trick of subliminal seduction transcends to hypnotic mind control in John Carpenter's latest science-fiction thriller, They Live Here, Carpenter gives us a cold, hard reality, then strips it away to reveal a grimmer reality within ourselves and our society. Where face value takes on a completely new meaning; where reality is not what one creates, but what one takes. With the approaching close to another decade, progress on one end of society's spectrum continues to escalate as the other end tailspins into a depression which rivals that of the '30s. With approximately one-half of one percent of our country's population holding 50 percent of our country's wealth, it is all too evident that the gap between different socioeconomic classes continues to widen. On a larger scale, first world nations continue to exploit the people and natural resources of third world countries, deepening the chasm between economic classes world-wide, creating entire nations of "have nots." With They Live Carpenter takes this societal problem to an even larger, more encompassing level--that of galaxy-wide exploitation of third world planets by aliens who gain control over inhabitants via the mass media. Taking over under the guise of successful humans, Carpenter's aliens show us a bit too much of our own real world. As they corrupt those they can into aiding their mission and hypnotize the rest of the population with subliminal messages hidden in television broadcasts and print mediums, they continue to deplete all of the earth's natural and human resources available. Carpenter has combined his masterful touch of science-fiction with a strong social commentary, delivering a thriller of a political satire which reflects shades of our society today: a society where monetary gain is the only game in town, and where one's soul may be easily exchanged for power and prestige. They Live asks us to take another look at the world we are creating and drives home the point of what the future may hold for all of us. 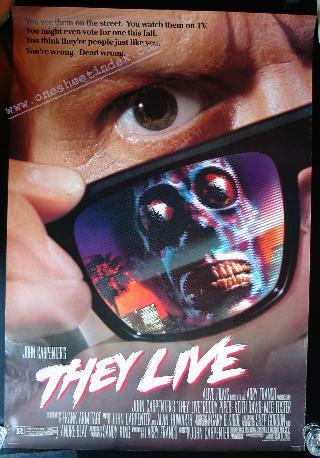 Principal photography for They Live began on March 7, 1988 on location in Los Angeles. The film addresses the issues of the homeless in our country, social irresponsibility, mass consumption, environmental destruction, corruption, the attractiveness of our capitalistic society and the incredibly strong influence of the communications media. By combining these issues with exploitive alien forces, Carpenter has welded a powerful film--an action packed political satire that maintains an intriguing, exciting edge of science-fiction. Based upon the short story ....... "Eight O'Clock in the Morning"